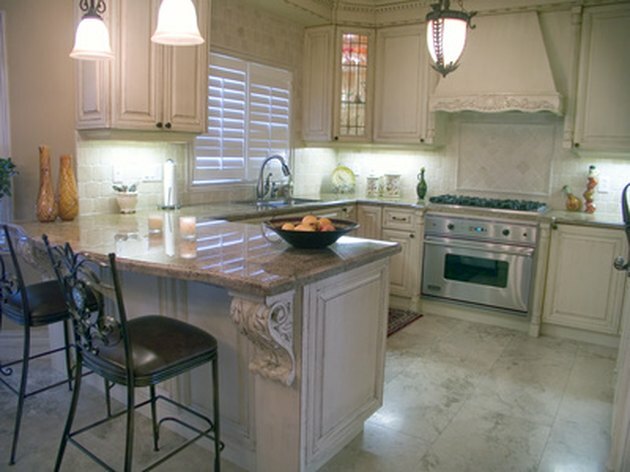 Granite counter tops are beautiful and durable, but require upkeep to keep them looking their best. Daily cleaning with warm water and mild dish washing detergent is recommended. Coffee, whether from spills or cup rings, can leave stains on granite counter tops. When possible, wipe up stains as soon as they occur to prevent staining. Stains that are not wiped up immediately require additional attention. For coffee stains on granite, first clean the area with a soft cloth saturated with warm water and dish washing liquid. If gentle pressure doesn't remove the stain try one of these alternatives. Create a paste from a tablespoon or two of dish soap, one cup of flour and enough water to make a thick paste. Apply directly to the stain, cover with plastic wrap and leave undisturbed overnight. The next day, remove the dried paste with a plastic spatula or other non-scratching implement, then wipe area with a damp paper towel. If the stain remains, combine one tbsp. of hydrogen peroxide with two drops of ammonia and apply to the stain with a soft cloth. Rinse immediately with warm water and buff dry. Cathy Lanski is a Buffalo, New York based writer who has been writing for more than twenty years on widely ranging topics from parenting to real estate to concerts. Her work has appeared in "Buffalo Rising," "Buffalo News," Buffalo.com and "Oatmeal Studios." Lanski holds a Bachelor of Arts in Communication.